​My tongs are approximately 11 inches in total length and made from 14mm round 1018 mild steel. I prefer shorter, stouter tongs for a variety of reasons. If you are in need of longer tongs, let me know (or see my pick-up style tong below). And mild steel allows you to quench tongs over and over without stress cracking. I have spent a lot of time perfecting my tongs. I guarantee your satisfaction. There is hardly anything in blacksmithing more frustrating than having a hot piece of metal jumping around when you are hammering not to mention dangerous. When it comes to working with hot steel, if you can't hold it right you can't hit it right. ​Flat style - Flat tongs are ideal for flats and can work with smaller square stock too. Since the jaws are open on the sides, they hold only according to thickness and so any width will work. ​Blade style - My blade tongs are for flat stock only and are width specific. The advantage they have over flat tongs is the ability to hold on edge when hammering. I size them for 1/4" (~ 6mm) thickness but they will also work with thinner stock. Please specify if you need this style for thicker sizes such as 3/8" (~ 10mm). 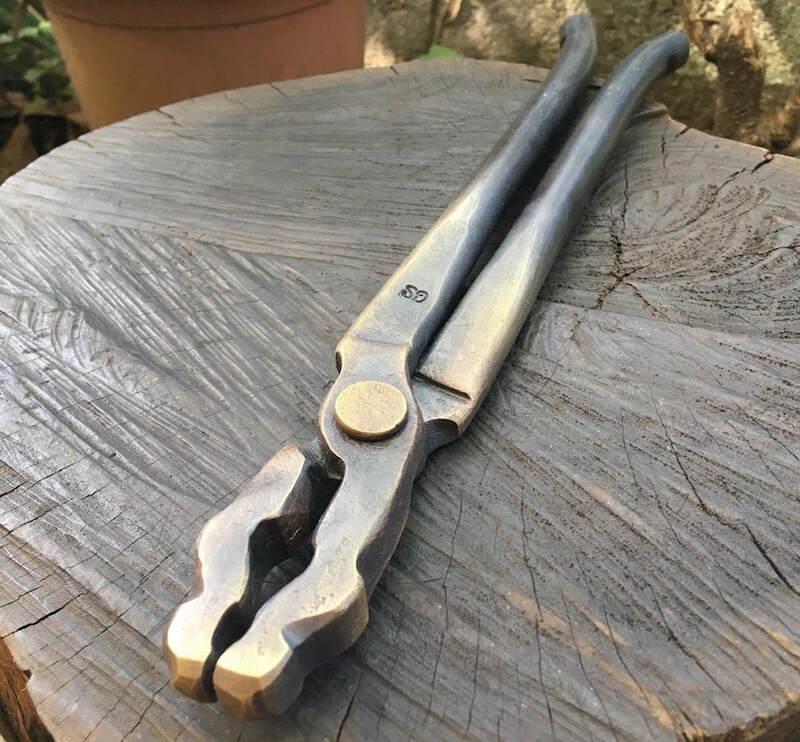 ​Dragon Jaw style - Though not so much a multi-purpose style tong, my dragon jaw tongs are versatile and can hold some stock across the jaws as well as in-line. I mainly size these for flats and the sizes indicate the thickness of stock they are made to hold. Square style - The V shares jaws are perfect for square stock and will hold round stock of similar size as well. Bent Knee style - I make my bent knee tongs for flats, rounds and squares. The advantage of this offset jaw style tong is the ability to hold at points along the length of your stock and not necessarily from one end or the other. They also allow space for upset ends to be held toward you. They can take some getting used to but are one of my favorite styles. Punch style - This style of tong is mainly for holding rounds across the jaws, as for when holding a punch. I myself use the largest size of this style as a hammer-eye tong. Pick-up style - Since my standard tong length is relatively short, I offer this longer tong (~13" to 14" in total length) to help with getting smaller items in and out of the forge to where you can grasp with shorter forging tongs. This style may also be useful for forging some flat stock. Scroll style - This tong is mainly for manipulating thin, fine sections of hot steel (like scrolls) rather than holding stock while hammering. However, this style will also hold thin sections reasonably well for forge work.